WE HOPE THAT YOU WON'T EVER SEE A LOBSTER LIKE THIS. SHE'S A COOKED FEMALE AND WE'RE TRYING TO KEEP THE FEMALES ALIVE AND THRIVING SO THAT OUR SONS CAN BE FISHING LOBSTERS IN THE FUTURE AND YOU CAN BE EATING THEM TOO! THE WHOLE LOBSTER FISHERY CAME UNDER THREAT WHEN OLD STYLE POTS WERE IMPROVED TO THE POINT WHERE LOBSTERS COULD NOT ESCAPE. MANY UNDERSIZED LOBSTERS AND FEMALES WITH EGGS WERE BEING LANDED. 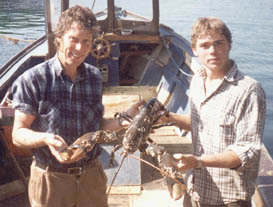 THE ABOVE NAMED ASSOCIATION WAS FORMED AS PART OF THE IRISH LOBSTER ASSOCIATION FOR THE CONSERVATION OF THE SPECIES AND THE LIVELIHOOD OF THE FISHERMEN. FEMALES IN BERRY (EGGS) ARE V NOTCHED IN THE TAIL AND RETURNED TO THE SEA. THE MINIMUM ALLOWABLE SIZE FOR MARKETABLE LOBSTERS IS A CARAPACE LENGTH OF 87 MILIMETRES, MEASURED FROM BEHIND THE EYE TO THE BEGINNING OF THE TAIL. A MEASUREMENT GUAGE IS AVAILABLE AND ANY LOBSTER WHOSE CARAPACE CAN BE FITTED INSIDE THIS GUAGE IS UNDERSIZE. IT IS ILLEGAL TO BE IN POSESSION OF A V NOTCHED OR UNDERSIZED LOBSTER. BUYERS AND RESTAURANT OWNERS BEWARE! ONE RECENT PROSECUTION RESULTED IN A FINE OF £2,000 BUT THE MAXIMUM FINE CAN BE AS HIGH AS £20,000. AT ONE TIME ANYONE COULD FISH FOR LOBSTERS. TOURISTS AND SUMMER VISITORS WOULD OFTEN HAVE A FEW POTS. ANYONE WITH A BOAT AND ACCESS TO THE GROUNDS COULD REAP THE BENEFITS. NOW, YOU ARE REQUIRED TO BE A FULLY PAID UP MEMBER OF THE IRISH LOBSTER ASSOCIATION OR ITS AFFILIATES AND THE REGISTERED OWNER OF A LICENSED FISHING VESSEL BEFORE YOU BEGIN LOBSTER FISHING. NEW MEMBERSHIP IS RESTRICTED TO THOSE CURRENTLY ENGAGED IN FISHING AND THE CURRENT JOINING FEE IS £5,000. THOSE FISHING ILLEGALLY RISK A HEAVY FINE AND HAVING THEIR POTS CONFISCATED BY THE RELEVANT AUTHORITIES. WE DON'T OFTEN SEE THEM THIS BIG ANYMORE BUT HOPEFULLY WITH THE CO-OPERATION OF ALL CONCERNED, THEY WON'T BECOME EXTINCT EITHER!